Amanda Ripley was astonished when she learned that the internationally given PISA exam revealed that American students were not doing well. Not only were they failing to excel on the exam, but their scores fell under countries that were not considered great places to get an education. Ripley followed three foreign exchange students as they traveled from the United States to Finland, South Korea, and Poland. 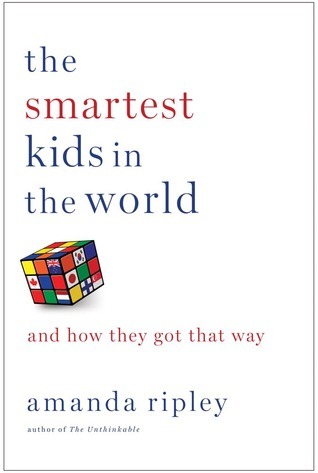 Their experiences attending school in vastly different systems form the basis for this book, as Ripley asks what we are doing right in educating our children and what needs to change. This book received a lot of acclaim and a lot of criticism. In the introduction, the author herself explains that, until a few years ago, she did not want to write about education. But now, with the advent of her first book about education, she is being heralded as an authority. That give some readers pause. There is also the issue of the sources Ripley uses. The exam that is the basis for the book takes only a very small sample of students. And although Ripley interviewed many students and educators around the world, it focuses on just three children who attend just three schools in just three nations. Perhaps there is folly in believing that this tiny group of children and teens are indicative of education as a whole. But until we decide that worldwide standards are called for, what can we do other than take a sampling? As a parent, reading this book made me think quite a bit about how we learn and how education is run in this country. Learning that students in Korea spend 12-18 hours per day in school made me grateful (for just a moment) for half-day kindergarten. But I understand that Korea's focus on learning over sports or music creates students who are fully committed to their education One of the most important points that Ripley makes is that we get what we put into our education system. When we make education an easy major in college and a low-risk career path, we can't be surprised when some of our teachers are less than excellent. Countries such as Finland make becoming a teacher incredibly difficult and only the top students can apply for their certification. This ensures that teachers are passionate about both teaching and their specific concentrations, instead of making teachers who really wanted to be high school coaches or who saw education as a way to take easy classes in college. There are moments while reading this book when solving these problems seem simple. This has a lot to do with Ripley's straightforward, easy style. But she knows as well as we do that this is not a problem that can be solved with a quick fix. This is a giant issue - as parents, as educators, as American people, we have to create an education system where our children can excel in careers, both locally and internationally. The Smartest Kids in the World is a good place for us to start asking the right questions. A someone who trained in education while I was in my undergrad, there's a lot here that I think I would agree with. We're so far behind so many places as far as education goes - especially Finland which as far as I can tell seems like the best place EVER to be as a teacher. And I know I'm biased, but it really seems they have their priorities right - and not just for teachers. Their whole system revolves around what is best for students. That being said, I've read a lot of literature praising Finland's system, but not any criticizing it and I'd be curious to see the other side of the system. Anyway totally got sidetracked - this looks like an interesting read! I really appreciated your insight! Since my son is in school now, I am very interested in our education system. I was really struck by the idea that students in Finland (and other countries) expect to work really hard for results and school is a priority for them. It seems simple, but I feel like a lot of American students expect that they can just wing it.